rif and I had dinner at Buffalo Steakhouse, Sunway Mentari last weekend. This place was recommended by his friend for decent and value-for-money western food. We both ordered the set dinner. 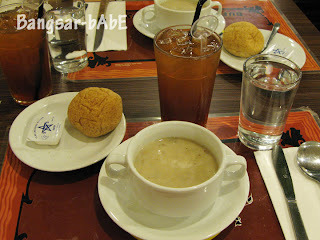 The set came with a soup of the day, main course, ice lemon tea and ice cream for the price tag of RM16.90++. 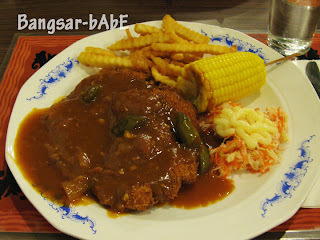 I had the Cordon Bleu Steak while rif opted for the Chicken Chop with Gravy. The chicken chop was OK. I liked how they added capsicums into brown mushroom gravy. But that’s just me..I like capsicums. The coleslaw that came with it was forgettable. Sad-looking with a squeeze of mayo on top. Ditto to the fries as they were over-fried. Tasted more like chips…or biscuits. We’re both not fans of corn-on-the-cob so no comments here. My cordon bleu steak was something different. Don’t think it’s really cordon bleu as cordon bleu usually calls for cheese and ham stuffed inside the meat. This version is just beef steak topped with brown sauce and sprinkled with cheese on top. Still can’t figure out whether I like it or not. I’ve had chicken and pork cordon bleu before…but not beef cordon bleu. Let’s just say this combo didn’t exactly rock my boat. rif thought this was not bad. 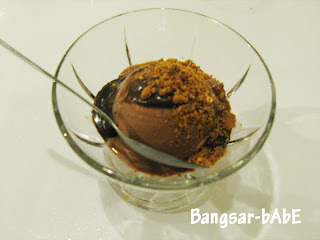 We were given chocolate ice cream as dessert. It’s just normal ice cream so nothing to shout about. The bill came up to RM37.18 for the both of us. Pretty reasonable I would say. In a nutshell, average tasting food, cafe-like ambiance and budget-friendly prices. I wouldn’t mind coming back to try their other dishes.